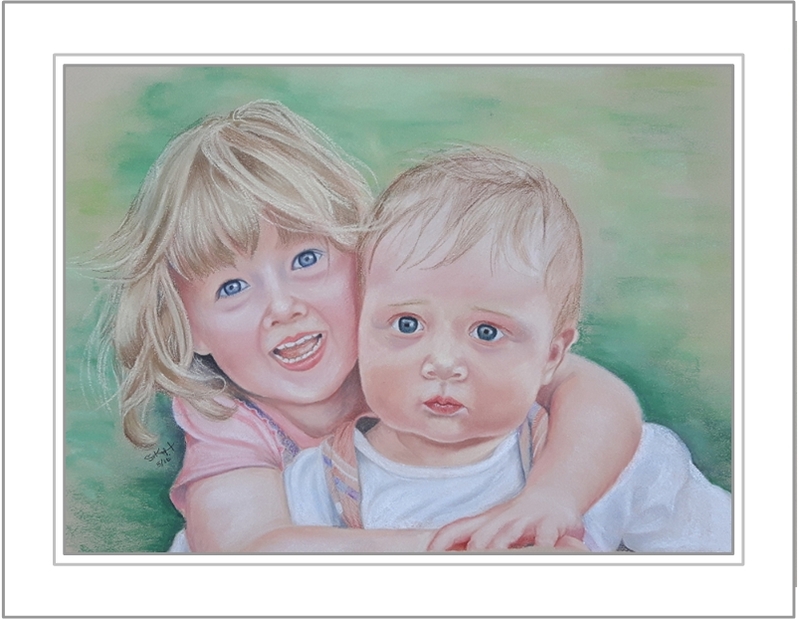 I recently commissioned a portrait of my two children from Susan, from my favourite photograph. I really wanted Susan to capture a very special moment in time, rather than a posed studio picture, and that’s exactly what she did. it really was all about capturing the moment for me. I was in the garden hanging the washing, my son was 8 months old sat in his bumbo (wearing my favourite of all his baby outfits) and my daughter was dancing around entertaining him, full of the joys of spring. She suddenly threw her arms around him, he didn’t know what hit him! It was so funny and I managed to get it on camera! It was the first time they had really interacted. I am really delighted with the results, not only with the likenesses of the children, but the way she has totally captured the energy of the original photo. Susan totally captured the moment – I had no words – It actually made me cry a bit! I feel that the children’s personalities really shine through, and I am absolutely delighted with the results. Susan was a pleasure to deal with, kept me up to date with progress and was open to my ideas. I would wholeheartedly recommend her as a portrait artist. In fact I think I need to have some more children just so you can paint them!